‘FRANK – THE MAN. THE MUSIC.’ DEBUTS AT THE PALAZZO®: “FRANK –The Man. The Music.” starring Bob Anderson will make its debut at The Palazzo® Las Vegas on Saturday, Jan. 24. The show honoring the life and music of Frank Sinatra will feature a 32-piece orchestra under the musical direction of Vincent Falcone. Anderson is transformed into Sinatra with the help of Oscar®-nominated makeup artist Kazu Tsuji, who aged Brad Pitt in the movie “The Curious Case of Benjamin Button.” The musical journey through the legendary crooner’s timeless hits highlights three distinct areas of Sinatra’s career: the recording studio, television specials, and personal appearances. 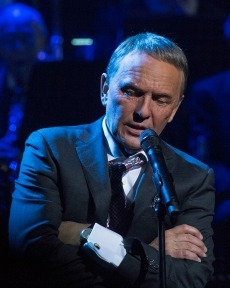 The 90-minute production opens at The Palazzo Theatre in the year that celebrates the 100th anniversary of Sinatra’s birth. STONEY’S ROCKIN’ COUNTRY BECOMES LAS VEGAS BULL: Las Vegas Bull is the new name for the former Stoney’s Rockin’ Country. The “country club” with a Western twist still features country music, free line dancing lessons, bull riding, and more. On Thursdays, which is Ladies Night, cowgirls enjoy $1 drinks all night long. Located at Town Square, Las Vegas Bull is open Wednesday from 5 p.m. to closing and Thursday, Friday and Saturday from 7 p.m. to closing. Now through Feb. 20, Las Vegas Bull is rewarding loyal guests with the chance to win a custom rebuilt 1979 Ford Ranchero GT. Each guest who purchases either a Jack Daniels or Pabst Blue Ribbon Bottomless Boot is qualified to enter. The winner of the car will be drawn on Feb. 21 and must be present to win. JOURNEY ANNOUNCES NINE-SHOW HARD ROCK RESIDENCY: Legendary rock band Journey will make its way to The Joint inside Hard Rock for a nine-show residency, “Journey Las Vegas,” from Wednesday, April 29 to Saturday, May 16. 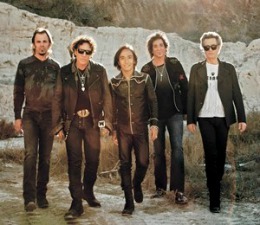 Since its formation in 1973, Journey has kept the music alive with classic-rock radio airplay and a heavy touring schedule. TV series such as FOX’s “Glee” and HBO’s “The Sopranos” have also made the group’s song, “Don’t Stop Believin’,” a sensation decades after its release. Tickets start at $59.50. 8 NOODLE BAR IS OPEN AT RED ROCK RESORT: Now open at Red Rock Resort is 8 Noodle Bar serving lunch and dinner daily in the heart of Station Casinos’ Summerlin resort. The restaurant showcases a contemporary twist on traditional Asian dishes, served in an intimate atmosphere designed with vibrant colors and Feng Shui elements. Created by Chef Andy Vu, the menu showcases an array of Chinese, Japanese, Vietnamese and Thai cuisine, with an emphasis on noodle and rice bowls, steamed buns, pot stickers, spring rolls and more. DOWNTOWN’S RACEJAM CONCERT WILL FEATURE CHEAP TRICK: Cheap Trick will headline NASCAR Weekend in Las Vegas with the free 12th Annual RaceJam concert at Fremont Street Experience on Saturday, March 7 at 9 p.m. on the 3rd Street Stage.The concert is part of the 12th Annual RaceJam 2015, a four-day event celebrating NASCAR Weekend with free nightly entertainment plus NASCAR merchandise booths taking place March 5–8. The annual downtown Las Vegas street festival and concert is held in conjunction with NASCAR Weekend, which features the Kobalt 400 NASCAR Sprint Cup Series race on Sunday, March 8 and the Boyd Gaming 300 NASCAR Xfinity Series race on Saturday, March 7, both at Las Vegas Motor Speedway. SOUTH POINT HOSTS ANNUAL DIVAS’ DAY OUT – JAN. 24: Las Vegas’ annual Divas’ Day Out is set for Saturday, Jan. 24 from 10 a.m. to 4 p.m. at South Point with more than 7,000 attendees expected. The event will feature more than 150 businesses geared towards women and specializing in health, fitness, beauty, fashion, motherhood, finance, education and careers. Attendees will enjoy celebrity appearances by Frank Marino, Australia’s Thunder from Down Under, Michael Grimm, Derek Hough and more. This event is free and open to the public. BELLAGIO’S ‘ART & WINE: A PERFECT PAIRING’ EVENTS CONTINUE: Bellagio Gallery of Fine Art (BGFA) combines the best of both worlds with “Art & Wine: A Perfect Pairing” on the second Wednesday of each month from 5-7 p.m. at the gallery. The event pairs wines from Bellagio’s cellar with artwork featured in the gallery’s new exhibition “Fabergé Revealed.” Highlighting the program is the interactive conversation about wine and art, blending the expertise of Jason Smith, Bellagio’s director of wine and Master Sommelier, with the knowledge of Tarissa Tiberti, BGFA executive director. Tickets are $34 for BGFA members and $42 for non-members. SEARSUCKER LAS VEGAS WILL OPEN IN SPRING AT CAESARS PALACE: Searsucker Las Vegas will debut at Caesars Palace this spring and host a job fair Jan. 26-28 to fill restaurant-based positions. Las Vegas will become the fourth outpost helmed by celebrity chef Brian Malarkey and join existing locations in Austin, Texas, Del Mar, Calif., and the restaurant’s flagship location in San Diego’s famed Gaslamp Quarter. 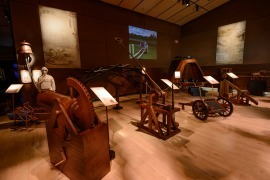 FRONT LINE NEWS CLIPS: Imagine Exhibitions Gallery current feature, Da Vinci The Exhibition, at The Venetian Las Vegas® will end its limited engagement this week on Jan. 15. This exhibit is a comprehensive exploration of the life and work of the original Renaissance man. Iconic rocker Jon Anderson canceled his Saturday, Jan. 17 performance scheduled at Boulder Station due to laryngitis. Singers Gary Anthony as Frank Sinatra and Denise Rose as Judy Garland will perform their “Happy Birthday Mr. Sinatra” show at the Italian American Club on Thursday, Jan. 29 at 8 p.m. Tickets are $20. Every Friday night at 9:30 p.m. at the Onyx Theatre, there is a 90-minute improv comedy show with original sketches. Tickets are $10. French-Italian apparel manufacturer and lifestyle brand Moncler has opened its first Las Vegas boutique inside The Forum Shops at Caesars. Founded in 1952 by René Ramillon, Moncler is most known for its down jackets and sportswear. Remedy’s at 530 Conestoga Way in Henderson will host its annual Hillbilly Ball on Saturday, Jan. 24 at 8 p.m. and there is no cover for the party. All guests are encouraged to grab their overalls, rock their a-shirts, don their trucker hats and embrace their inner redneck in the costume contest. Rachel’s Kitchen in Summerlin at 9691 Trailwood Drive will feature Steve Reed, Claudia Reed and Mark Vranesh on Jan. 15 from 5-8 p.m. The Art of Travel will bring together the viewpoints of a photographer, a jewelry designer and mixed media artist with the walls of Rachel’s Kitchen becoming a gallery of travel images. The exhibit will be on display throughout the month. 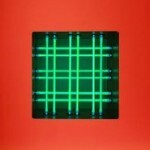 Las Vegas artist Pasha Rafat has his Light Works exhibition at the Brett Wesley Gallery downtown at 1025 S. First Street through Jan. 31. Light has been the primary medium for Rafat, who was born in Iran and is now a professor of art at the University of Nevada, Las Vegas where he teaches photography and multi-media courses including art in public places. “Jubilee” at Bally’s is holding auditions for female and male dancers and singers on Monday, Jan. 19. Clark County School District students who bring in their most recent report cards showing straight A’s will receive 2-for-1 passes to ride the The Big Apple Coaster at New York-New York. The offer is valid for one-time use January –August 2015. Guests must be at least 54 inches tall to ride. 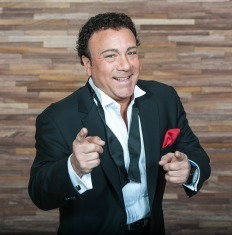 FREE BUFFET AND SHOW TICKETS FOR BLOOD DONATIONS: Throughout the month of January, all donors will receive a voucher for two admissions to see Frankie Scinta in the Showroom at the D Las Vegas. For qualifying locations visit: www.unitedbloodservices.org/lv. At the Orleans on Jan. 16 from 9 a.m.–5 p.m., blood donors visiting Salon Room J & M will receive a free Buffet voucher. Restrictions apply. On Friday, Jan. 23 from 3-7 p.m., a blood drive will be held at Cosmic Comics, 3830 E. Flamingo Road. All donors will receive two free tickets to see “Evil Dead The Musical” at the V Theater and a voucher for two admissions to see Frankie Scinta in the Showroom at the D Las Vegas. COMMONWEALTH PARTNERS WITH CUPID’S UNDIE RUN TO RAISE MONEY: The downtown cocktail bar Commonwealth will team up with Cupid’s Undie Run, a mile-long run to benefit the Children’s Tumor Foundation, starting at noon on Saturday, Feb. 14. Cupid’s Undie Run has recently expanded to 38 cities across the United States and Australia, and will arrive in Las Vegas for the first time this year. Tickets are available for $35 through Jan. 16; $40 from Jan. 17-30; and $50 from Jan. 31-Feb. 14. Proceeds will benefit the Children’s Tumor Foundation, a nonprofit organization dedicated to providing relief for those suffering from neurofibromatosis (NF). Commonwealth will serve as the starting and finishing point for the race, hosting more than 400 underwear-clad runners for an afternoon of fitness and Valentine’s Day festivities. Pre and post-race cocktails will be available for participants at Commonwealth who will be able to use the venue to store their articles. Park on Fremont will offer a 15 percent total check discount to all participants of Cupid’s Undie Run all day on Saturday, Feb. 14. 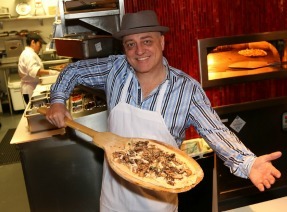 TREVI CROWNED CHARITY PIZZA COOKING COMPETITION WINNER: In honor of National Pizza Week, TREVI Italian Restaurant at the heart of The Forum Shops at Caesars hosted a recent celebrity charity pizza cook-off crowning Doug Elfman of the Las Vegas Review-Journal champion with his pizza featuring Portobello, oyster, button and shiitake mushrooms. The winning $500 donation will benefit Poppy Foundation, a local cat shelter. As the competition winner, Elfman’s pizza will be featured on TREVI’s menu for a week beginning Monday, Jan. 12 with the remaining pizzas included in weeks to follow. MERCADITO EXPANDS TACOS FOR STRENGTH CAMPAIGN: All Mercadito restaurants in New York City, Chicago and Las Vegas will participate in the 2015 5th Annual Tacos for Strength campaign. Highly regarded chefs will join Mercadito’s Chef Patricio Sandoval in his initiative to support Share Our Strength and its mission to end childhood hunger. Each month, Sandoval invites a different chef to create a taco inspired by their culinary or personal passions that is served in all Mercadito restaurants with a portion of proceeds going to Share Our Strength. The 2015 program has been launched with Chef John Gremo of 17◦ South in Las Vegas and his New England Fish and Chips Taco. Tacos for Strength are available for dinner for four per order for $17.50 or for lunch three per order for $14.50 locally at Mercadito in Red Rock Resort. AUTHOR DISCUSSES ‘BLACK JETS OF AREA 51!’ AT MUSEUM: The first lecture of the year at the National Atomic Testing Museum on Friday, Jan. 16 at 6 p.m. will feature author Bill Yenne discussing the “Black Jets of Area 51!” separating fact from fiction and discovering the real story behind Area 51. This lecture is free to members, $10 for students and $20 for non-members; RSVP by calling 702-794-5151. LOCAL YOUTH MUSICIANS PLAY CONCERTS AT HOUSE OF BLUES: Now with two School of Rock locations in Nevada, students are kicking off 2015 with a dozen themed concerts this month at House of Blues inside Mandalay Bay. Tickets are $10 when purchased in advance at either school or $12 at the door. Remaining concerts on Jan. 17 and 18 include: Ireland vs. England with music from each country; The Music of 311 vs. Red Hot Chili Peppers; and A Tribute To Aerosmith. HARD ROCK RISING IS GLOBAL BATTLE OF THE BANDS COMPETITION: For the fifth straight year, Hard Rock is continuing its commitment to aspiring musicians by holding a worldwide search for talented bands to showcase on its international stage. Hard Rock Rising, the world’s most far-reaching battle of the bands competition gives local groups a shot at stardom with an all-expenses paid trip to Barcelona, Spain, to compete for the chance to perform at the first-ever Hard Rock Rising Barcelona music festival this summer on July 24-25. Hard Rock, in partnership with ReverbNation, the global leader in providing independent musicians tools to manage every aspect of their careers, is hosting an open registration through Monday, Jan. 26, 2015, for bands wishing to participate in the international battle. Bands can visit HardRockRising.com to register and must originate from within a 100-mile radius of a Hard Rock location in order to participate. TREVI ITALIAN RESTAURANT IS ‘BEST OF THE KNOT’ WINNER FOR 2015: TREVI Italian Restaurant inside The Forum Shops at Caesars and located next to the Fountain of the Gods has been named “Best of Weddings” by The Knot Magazine for 2015. TREVI also received the award for 2012 from The Knot, which is one of the nation’s leading wedding resources. CONVENTION NEWS: The Winter 2015 Las Vegas Market returns to the World Market Center Las Vegas, Jan. 18-22 with 50,000 expected attendees.The NAHB International Builders’ Show (IBS) in conjunction with the Kitchen & Bath Industry Show (KIBS) returns to the Las Vegas Convention Center for Design & Construction Week, Jan. 20-22. IBS expects 55,000 attendees and KBIS 24,000. The Shooting Hunting and Outdoor Trade Show (SHOT Show) and conference will take place at the Sands Expo and Convention Center, Jan. 20-23. Upcoming conventions next month include: World of Concrete 2015 – Feb. 3-6; Safari Club International 43th Annual Hunter’s Convention – Feb. 4-7; Off-Price Specialist Show Spring 2015 – Feb. 15-18; MAGIC Marketplace Spring Show 2015 – Feb. 17-19; and Western Veterinary Conference 2015 – Feb. 15-19. 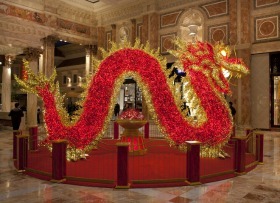 GIANT ILLUMINATED DRAGON DISPLAY WELCOMES CHINESE NEW YEAR: Celebrating the Year of the Goat, The Forum Shops at Caesars is featuring a giant illuminate dragon display this month and running throughout the Chinese New Year celebratory season, which begins Feb. 19. The dragon is a traditional symbol of power, strength, and good luck. The fabled creature on display on the Fortuna Terrace is 22-ft. long, 6 ft. wide and 12 ft. high. The massive 950-pound steel-framed dragon is covered in 30,000 red and amber LED lights. DOWNTOWN LAS VEGAS EVENTS CENTER HOSTS HAWAII FESTIVAL: The Downtown Las Vegas Events Center (DLVEC) is hosting the Hawaii Festival for a second weekend Jan. 16 and 17. The festival at the open-air event center features island-style food, crafts, entertainment, music and more with free admission Friday from 4-8 p.m. and Saturday from noon to 8 p.m. Live bands take the stage nightly at 7 p.m. Local favorite Mahi will perform on Jan. 16. He first gained national attention in 2011 when he made it to the Top 100 on “American Idol” and on Jan. 17 Filipino-Hawaiian singer Baba B, nicknamed “The Big Boy in Love,” will appear. The festival is part of the D Las Vegas’ Hawaii Appreciation Week, a weeklong celebration at the downtown casino-hotel featuring special offers and programming including a $10,000 Holoholo Slot Tournament, performances by popular comedians Joey Guila and Mel Cabang, and more. HAKKASAN NIGHTCLUB AT MGM ANNOUNCES 2015 DJ LINEUP: Hakkasan Las Vegas Nightclub at MGM Grand has extended Tiësto’s contract to an exclusive multi-year agreement. The GRAMMY Award-nominated icon is set to continue his “Club Life” residency at Hakkasan Nightclub and his “Republic of Tiësto” residency at the daylife destination Wet Republic. In June, Tiësto released his first artist album in five years entitled “A Town Called Paradise.” Inspired by Las Vegas, the album yielded his first two gold singles in the United States with “Wasted” featuring Matthew Koma and “Red Lights.” Hakkasan will welcome Dimitri Vegas & Like Mike and Canadian sensations DVBBS to its exclusive roster as well as French talent Tchami, renowned producer Ummet Ozcan and Dutch industry stalwart Don Diablo. More announcements will take place throughout the year. Other returning featured artists include Steve Aoki, Above & Beyond, Botnek, Burns, The Chainsmokers, Fergie (DJ), Hardwell, Dada Life, Sunnery James & Ryan Marciano, Moti, Bingo Players, Eva Shaw, Dzeko & Torres and W&W. HUSSONG’S CANTINA IN LAS VEGAS CELEBRATES FIVE YEARS: Through January, Hussong’s Cantina at The Shoppes at Mandalay Place is celebrating its five-year anniversary with the rock n’ roll mariachis, specials throughout the month, new menu additions and a social media contest. In 2010 the Las Vegas location of Hussong’s became the first U.S. outpost of the oldest cantina in Mexico, where as lore has it, the margarita was invented. Like the Hussong’s Cantina Facebook page for a chance to win a cruise to Ensenada or free margaritas and nachos for a year.